It's always so much more fun to see our favorite designers in person, and this was definitely true of Urban Chandy. 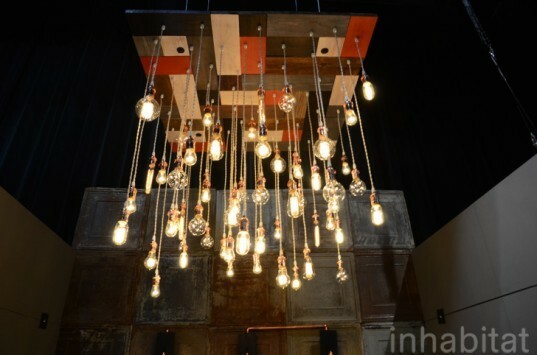 We featured their recycled urban chandeliers previously on Inhabitat, but we got to see their latest creation at Dumbo during BKLYN Designs 2013. The chandelier is made from a single piece of salvaged wood that is strung with a slew of Edison bulbs with funky coils. 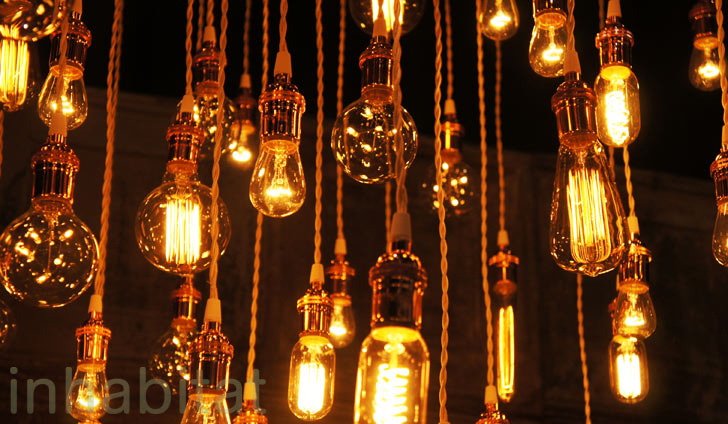 While Urban Chandy currently uses vintage Edison bulbs for their lighting, which critics worry is not the most environmentally-conscious choice, they do aspire to keep their energy as low as possible without compromising the uniqueness of their designs. For example, the mosaic chandelier has 60 bulbs in sum but together they use 904 watts of energy. Still, the Brooklyn-based team understands the importance of conscious lighting, and they are looking into alternatives for the future. Also on display at this year’s BKLYN Designs was their new reclaimed wooden hardwood floor converted into wooden sconces with copper hardware. These can be customized to include as many bulbs as the client wants and come with 40 watt bulbs. All in all, this is a fabulous concept, and a wonderful heirloom gift to pass on to successive generations. We love Urban Chandy’s work and can’t wait to see them again next year.